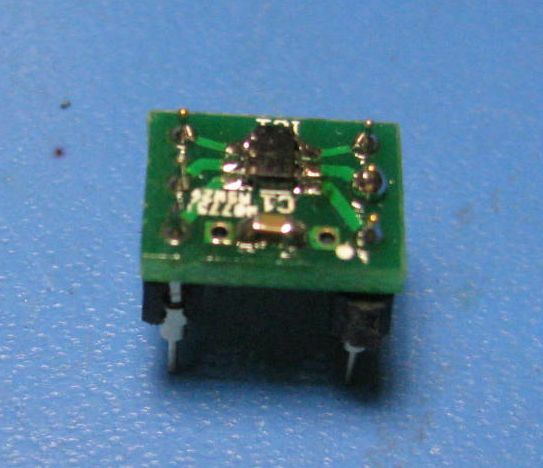 Many of these are posted as DIY (do it yourself) audio projects on diyaudio.com. I have bare PC boards available and, in several cases, offer the projects fully assembled. Also below you will find some build tips on NwAvGuy's O2 headphone amplifier, O2 parts, and other audio goodies. NOW SHIPPING! A mint-tin CMOY headphone amplifier using TI's brand new OP1688 headphone driver chip, plus two "9V" battteries with a real ground, not virtual, and a headphone relay. Features: ultra high peformance with extremely low battery drain thanks to the new TI chip. Now shipping! Twice as much of a good thing. Two of TI's new OPA1688 headphone driver chips in a parallel configuration for twice as much current output - 150mA per channel.. Features: Everything the standard Super CMOY offers plus twice the output current and capacitive load drive. An add-in board for NwAvGuy's O2 headphone amplifier that fits in the top slot of the B2-080 case. Features: 50uV DC output offset vs. 3000uA for the O2; 250mA (peak current) output buffers on each channel: headphone relay for zero turn-on & turn-off thumps; rail clamp diodes. A desktop version of NwAvGuy's famous O2 Headphone Amplifier. Features: dual-stage LDO power supply heat-sinked to the rear panel; 450mA of output current per channal; lower THD+N gain chips; 1K volume pot for lower Johnson noise. RCA in, 1/4 out. Optional internal ODAC on a top-slot carrier board. An inverting version of NwAvGuy's famous O2 headphone amplifier. Features: invverting input and output stages for lower distortion. +/-15.3Vdc power rails. FET input gain and output stages. 3.5mm & 1/4" out, RCA out. Holds ODAC..
A power supply and case for Victor's ultra low THD oscilaltor boards. Features: can be used on a tabletop or mounted in a Hammond 1598 case with up to 4 Victor baords. Batteries, AC input, constant current sinks to the boards. A top-slot carrier board to add a NwAvGuy ODAC to your ODA. An adapter board with the new SOT-23-6 sized TPS3701DDCT window comparator chp from TI that fits into a DIP-6 standard IC socket. The board includes a 0.1uF bypass capacitor across the power supply, plus a place on the bottom for a 0805 sized capacitor in parallel. Have an old NwAvGuy O2 Headphone Amplifier that needs repair, rehab, or some modifications? Have a bad jack that needs replacing? Want an O2 Booster Board installed? Click here to find out more!